The government, after more than a decade of talks, yesterday inked the Trade and Investment Cooperation Forum Agreement (Ticfa) with the US, ushering in a new era of communication between the two countries. Commerce Secretary Mahbub Ahmed and Acting Deputy of US Trade Representative Wendy Cutler signed the deal in Washington on behalf of Bangladesh and the US respectively. The version of the agreement signed was the one approved by the Hasina cabinet on June 17, Akramul Qader, Bangladesh’s ambassador to the US, told The Daily Star over telephone. “Our first target is to recover our trade privileges to the US, as Ticfa is a platform for resolving trade disputes between us,” said Commerce Minister GM Quader, adding that the issue would be raised in the first meeting of the forum. Following the twin industrial disasters of Tazreen fire and Rana Plaza collapse, the US on June 27 suspended Bangladesh’s Generalised System of Preferences status, which provided duty-free access to 97 percent of the country’s export items. In the second forum, to be held in Dhaka in three months’ time, Quader said the country would seek for withdrawal of duties for the remaining 3 percent of the products, which include readymade garment (RMG). Around 95 percent of the country’s exports to the US comprise of RMG product, for which 15.30 percent duty has to be paid. In 2012, the country paid $746 million as duty to the US government for exporting a little above $5 billion worth of RMG products. “Ticfa is just a platform for holding talks between the high level officials of the two countries’ commerce ministries. I am surprised that many people are criticising our decision to enter into such agreement with the US,” Quader added. 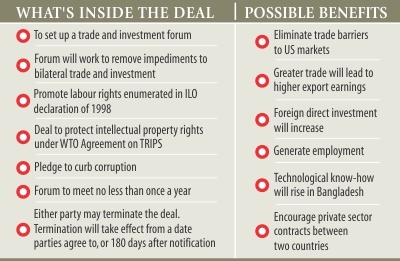 One such person opposing the deal is Anu Muhammad, a professor of economics at Jahangirnagar University. He said the government discounted three important issues in signing the agreement. The US has signed the Tifa or Ticfa or similar agreements with 92 countries and regional associations and groups, including the ones with which it has “big business turnover”. He said the government did not analyse the efficacy of Ticfa with those countries. The signing of Ticfa also does not guarantee good relationship with the US, the economist said, while citing the case of Nigeria and Pakistan. Talks for signing the Tifa, which was later renamed to Ticfa, officially started in 2002, although unofficially it began as far back as 1992.